To help you get started, we are happy to offer one-off taster sessions in Edinburgh or other areas of Scotland and the north of England, and to being contacted for help and advice from anyone around the world! Here, we also make the material we have created freely available to encourage you to deliver the sessions yourself in your own community, or to use the ideas at home. Please do get in touch through our Facebook page. We are not currently accepting invitations to bring Play & Pray’s full six-week course to local Edinburgh churches. What is Play & Pray? Play & Pray is a fun and imaginative series for pre-school children and their parent/s, grandparents or carers, helping to bring God into our daily conversation and experience. Over six one-hour sessions we lay out various ‘stations’ around a hall, room or church and invite everyone to engage with them at their own pace. The Stations are linked to a theme for each week such as You are Special or A Nature Walk, and there are lots of transferable ideas that parents can also try out at home, such as praying with bubbles, making a prayer flower pot, massaging hands and blessing our bodies. You can explore our outlines of sessions and ideas for stations. We have run 3 six-week Pray & Play courses, as well as several taster events. Our youngest participant has been six weeks old and, so far, most children are around two years old. They have brought with them mummy, daddy or granny. The flexible nature of Play & Pray means that it is also well-suited to children with special needs. We have found that weekday morning sessions work well. It is worth considering how the times fit in with local nursery hours and school collection for siblings. Two volunteers from Play & Pray set up the materials, facilitate and tidy up. Host churches provide refreshments and pay for resources. As participants arrive, they are welcomed and shown where to leave prams and coats. We gather on cushions with some cheerful music (we’re fond of Fischy Music’s Welcome Everybody, God Beside, You are Star and Music Maker), and some percussion shakers to play with. The group is led in Capacitar exercises, and then everyone joins in a song. While attention is focussed on the singing, a leader turns puppeteer, and then Basil and Percy appear. These are hand puppets who perform from ever-more ingeniously devised theatres – so far a pulpit, a set of half-doors and a blanket-laiden coat rail. The puppets are popular and engaging for pre-schoolers, and are met with squeals of delight. 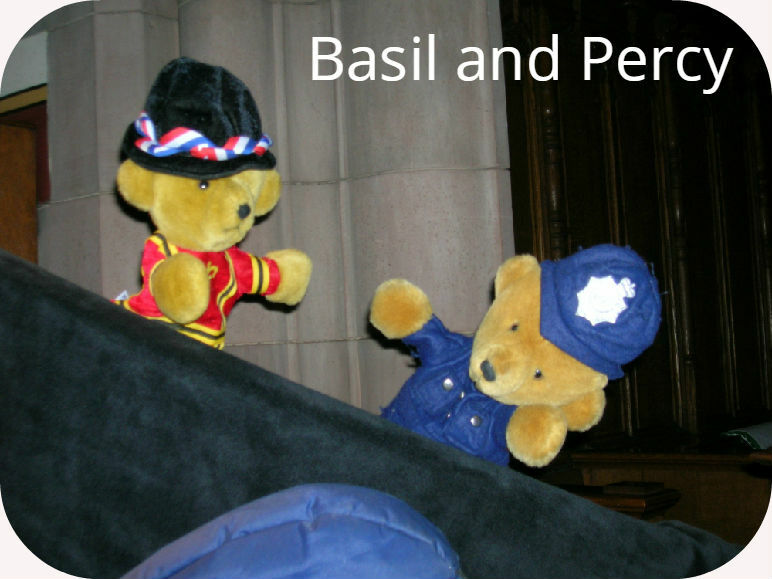 Basil and Percy’s scripts introduce the themes for each Play & Pray session. What are the Prayer Stations? After Basil and Percy are the prayer stations. These are five or six different areas set up for the children and their grown ups to move around and explore at their own pace. Handouts placed at each station offer suggestions or inspiration, but do not prescribe rigid tasks. Everyone is encouraged to do what feels comfortable. Descriptions, handout downloads and photographs of these are in our main Prayer Stations section. This takes around 45 minutes, and grown ups work alongside their children. The leaders are on hand to help where they see a need, perhaps by holding a baby so a mother can give attention to her toddler. There is often gentle conversation around the stations, but the focus is on enjoying the time to concentrate on the children and prayer. We have found that even the most energetic, action-oriented child is focused and purposeful. Some children may go everywhere, and some spend most of their time on just one or two activities. Then comes a time for coffee and snacks, aiming to support each other in knowing more of the God who both welcomes children and gives grace to busy adults. Most of the materials we use can be found in a toy shop, pound shop, large supermarket or online, e.g. playdough, stickers, paints, paper, etc. You probably chop your own fruit at home, but for the fruit station we recommend those handy pre-packed boxes of prepared fruit from the supermarket. Most of the prayer stations are assembled on large mats of PVC or oil cloth, which can be bought from fabric stores. If the floor is shiny, these can be laid over anti-slip underlay from IKEA. The polished stones and fool’s gold (mineral pyrite) used in the sand treasure hunt come from the gift shop at Dynamic Earth in Edinburgh, or can be bought for a few pounds on eBay (search for ‘gemstones’ or ‘tumblestones’). If you’d like to try the rice prayer station, we have written instructions on making sensory prayer rice. We have been inspired by Messy Church books, which we warmly recommend, and by the work of Rebecca Nye on children’s spirituality. We typically charge each family £30 for the six week Play & Pray series. This covers the cost of materials and snacks. The leaders are volunteers, and the cost of the hall and heating are met by the host church. We have found that around eight families participating is a good maximum, and we have successfully run the series with fewer. Is it just for church families? Everyone is welcome! The series is non-denominational, and the activities are intentionally non-prescriptive. At its heart, Play & Pray encourages families to recognise God in all things, at all times and in everything. It also helps to challenge various images of God and frees people into being more open to God who loves us absolutely. Yes, we talk about God, we talk about prayer, but in a way which is open to anyone from any background, and which gently encourages people to be more open themselves to encountering God. Do the helpers need to have criminal record disclosure? All our helpers have been checked by the UK Government’s Disclosure and Barring Service. However because parents remain with their own child and are responsible for them it is our understanding that a Disclosure check is not an absolute requirement for this course – although it is good practice. You may want to check that the host church has public liability insurance for events held in their premises. Help, what if I don’t know anything about Ignatian spirituality? Ignatian spirituality is particularly formed around the experience and reality of ‘finding God in all things’. We believe this is equally possible for young families. Although our original adult training was in the Ignatian tradition of spirituality there is no pre-requisite for this in order to run this course. We would encourage you to run the course from your own authentic experiences of God and prayer; the ‘practical theology’ behind the course arises from drawing out what is already there in everyday experience, not in teaching children new things. We are ‘only’ teaching children (and parents) how to become more aware of the God who is already with them. If, however, you would like to know more about Ignatian courses for adults – or the wider umbrella of contemplative spirituality – in your area, please Google or contact us. What if I’ve never run anything like this before? If you live near Edinburgh, Scotland you are very welcome to come and observe a Play & Pray session and chat to us. We are also happy to offer advice to those further away – please just get in touch through our Facebook page. Basically, you don’t need to be experts – enthusiasm and energy are the main requirements! If the material draws you and you want to adapt it to your own setting, we’d encourage you to give it a go; there is no ‘right’ way to do it!